Why did I want to participate? For a long time, I’ve been looking at the game development community from the outside with a lens that I feel a lot of people tend to see through. I’ve always considered game development an extremely intricate and difficult field to enter, and I was scared of trying my hand at it for a long time. I have made small clones of other games (pong, sokoban, etc) and I have enjoyed making those games, but they’re both relatively simple (exercise-sized, almost, to a certain extent). I have been wanting to get a little further into the game development scene for a while, and Ludum Dare seemed like the perfect opportunity. I’ve seen several Ludum Dare competitions go by over the past couple of years and I never thought I was good enough to actually do it. This time, I just went for it, and I’m really glad I did. As all of my friends know, I’m a big fan of The Binding of Isaac, and I’m always thinking about how that game and games similar in nature to it are put together. I ended up calling my game “Wappansai!” because it was one of the random strings I stuck in as a debug message as I was developing. It doesn’t mean anything other than that. 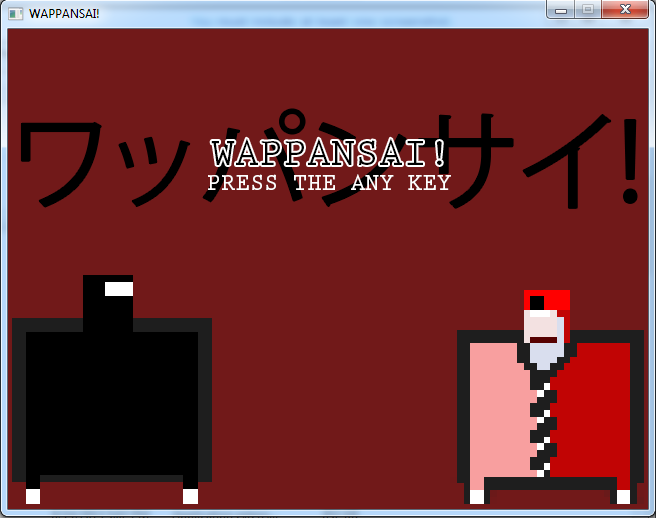 Anyway, in Wappansai!, you’re a big fat square ninja man who is stuck in a dungeon with some red business-men enemies. They don’t move, but if you don’t murder all of the enemies in the room within 10 seconds, you die. Running into enemies also kills you, as does falling into the many pits laid out around the room. 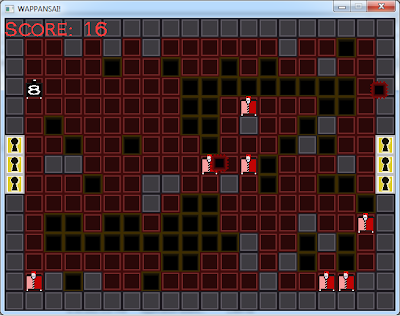 Later on, moving spike tiles get added, and those kill you as well. When you clear a room under 10 seconds, a door opens up and you move on to the next room where things get progressively more difficult. I think my high score in the final version of the game was somewhere around 17 rooms, so I definitely challenge everyone to beat that! Oh, and the tools I used were C++ and SDL 2.0, sfxr for sound bytes, and photoshop for graphics. I didn’t get around to making music because I don’t even know where to start with that! I have been reading Programming Game AI by Example on and off for a little while, and I decided to use Ludum Dare as an opportunity to start learning a little more about the State Design Pattern and Singletons, two concepts introduced early on in that book. I worked on throwing together a shell of a program that implemented these things before the competition, so I wouldn’t have to figure everything out as I was trying to get things done over the 48 hours, which was definitely a good idea. I was able to start working right when the clock started ticking instead of worrying about getting the design right as I was trying to implement the program. I’d recommend doing this if you plan to participate in a game jam; it really helped me out. That said, there were still some design pitfalls. For example, when you open chests in the game, there’s a (very slim) chance that you’ll get a laser gun from inside of it (usually it just takes all of your currently held items – haha! ), but the gun doesn’t spawn anywhere when this happens; it just magically goes into your character’s weapon slot and suddenly you’re firing lasers. The way I wanted this to work was, if you got lucky and got the laser gun from the chest, the gun would spawn somewhere on the map and you could go pick it up and feel awesome that that chest that normally screws you over by stealing all of your items just happened to spawn a freakin’ laser gun for you to play with. But, the way I organized my project, Tile objects had no way to modify Level objects, so I was unable to trigger an event when the chest (a type of Tile) was touched to modify the level (a Level), so I had to make a compromise there. There are certainly workarounds that I considered, but I couldn’t really do them within the time limit. It was a design flaw, and now I know that it was a design flaw. I can structure my code better now – that was one major learning point. I also learned a lot about randomly generated content, that was crazy! It actually went a lot smoother than I thought it would, but just seeing everything so randomized was amazing. Items, weapons, enemies, pits, and walls all get generated randomly based on how many rooms you’ve traversed, and just seeing that in play working (relatively) nicely was so cool. So I learned a lot there. The final, really huge thing that I discovered was that…holy crap, there are a lot of assets that go into games! I must have made over 50 sprites for Wappansai!, on top of tons of different sound clips (sfxr made this easy). A lot more time went into art than I expected, and I didn’t even animate anything…you don’t really think about it, but games have tons and tons of assets involved. Finishing a game in two days was really hard work and it could be really frustrating at times (especially using C++ with VS, those error messages are completely incomprehensible). But, it was totally worth the effort. I can say that I’ve made a game that is completely mine, and even though it’s not very good, it’s something thatI made and I love that I made it and I’m excited to make more things. It’s also really amazing that people actually do play your games. I’ve had several comments on my ludum dare game’s page already discussing the game that I made, and it’s so cool to see that. Playing everyone else’s games is also really awesome because you know that they went through the same thing that you did. Everyone’s really proud of their work, everyone worked hard to get something done, and it’s just a really nice community event that I’m so happy to have been a part of. I would absolutely do it again, and plan to! Who would I recommend Ludum Dare to? If you want to make games, do it. If you don’t know where to start, there are plenty of websites that can teach you the basics, and even if you don’t want/ know how to program, there are tools out there like GameMaker Studio that will allow you to program your game’s logic without actually writing code. If you don’t think you can do it alone, team up with someone. But if you want to make video games and have at least a basic knowledge of how they work, I think that Ludum Dare is an excellent way to test your skills and build something that you’ll be proud of. Where can you download my game? You can download, rate, and comment on Wappansai! 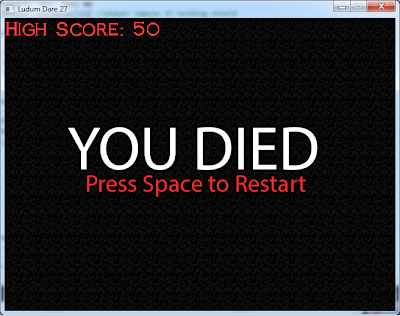 over at the Ludum Dare page for it. Thanks for reading!